Low-cost. Outstanding Value! This beautifully built one-bedroom holiday house shares a large garden site on the top of the hill above the village of Daratso, 5km from the bustling cosmopolitan city of Chania. See Holiday Fun. 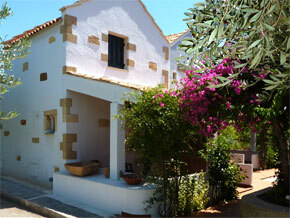 Daratso village itself is less than one kilometre away and has a supermarket, several tavernas and caf�/bars. Whilst close to all the modern facilities in Chania there is nevertheless still the feeling of being in a country village here, partly no doubt because the gardens border on open countryside. A short walk up the lane takes you to a path through olive trees, past an old cemetery and eventually to the village of Galatas. 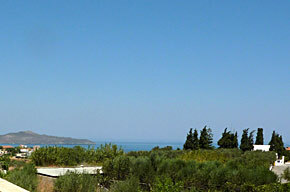 Continue on down into the valley and you arrive at the renowned lake and bird sanctuary at Agia. Villa Chrysanthi is sited in an area of genuine Cretan culture - there are no foreign-owned housing estate developments anywhere nearby. 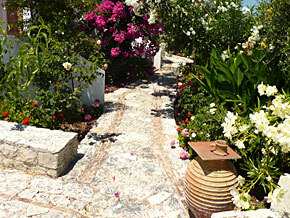 At the front of the house is a mini-courtyard paved with tiles and mosaics. This is partly shaded by a solid-roofed pergola built traditionally from timber beams, heavy bamboo and ceramic tiles. Solid and secure wood doors and windows lead us into the beautifully finished interior. 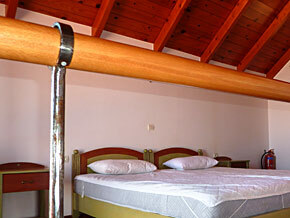 Immediately to the left there is bathroom fitted with a modern high quality suite and shower. 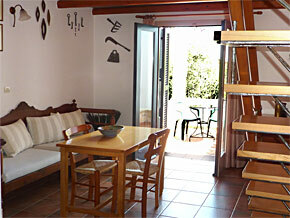 Beyond the entrance is the open plan kitchen/living room with traditional tables, chairs and an ultra-modern kitchen. There's a sink/drainer, refrigerator, small cooker with stainless steel extractor hood plus cupboards with more than enough crockery and cutlery for even a long stay. There is plenty of space in this downstairs living area to fit a fold-up bed or cot for a child if required. Double doors lead out onto a private patio at the rear of the building. The open plan stairs rise from the living area directly into the bedroom. 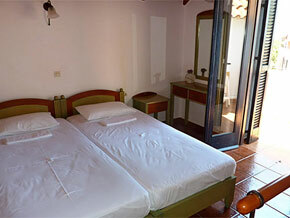 The bedroom is fitted with two single beds, a wardrobe and dressing table etc. The room has a pitched ceiling/roof clad with pine on wooden beams and gives the feeling of being in a beautiful airy "loft". From the end of the room, double doors lead out onto a enclosed balcony/terrace from which there are fabulous mountain and sea views over the trees in the foreground. This terrace is not overlooked and provides a small private sunbathing area. The house is decorated and finished to a very high standard including the floor tiles, bathroom fittings and even down to the number of electric outlets and lamp fittings. Round and about Chrysanthi there are curios and architectural idiosyncrasies which reflect Cretan building tradition whilst being incorporated into a modern building only 8 years old. Everything has been lovingly built using natural stone, wood and burnished metal. At the rear of the house there is a pathway interconnecting Villa Persephone, Villa Alexandra and Villa Chrysanthi through trees and shrubs where walls, pathways and columns have an almost Greco/Roman feel to them. This is a wonderful location for those who want peace and quiet in clean country air; who want to stroll to the simple pleasures of the local food and drink at the village tavernas and cafes - and yet be close to the vibrant city of Xania and all the 24 hour fun and excitement it has to offer. 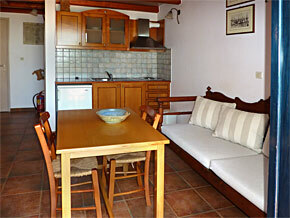 This lovely house and its fabulous gardens are a clean, comfortable, homely delight. Our rental pricing structure is very straightforward and based on the natural seasons of Winter, Spring, Summer and Autumn. We do not have complicated price bands that maximise prices around school holidays in any particular country. There are no hidden costs or casually mentioned extras as apparent afterthoughts - our prices include electricity, water and local authority charges, all linen, cleaning and immediate food supplies for arrival. We always offer you the freedom to choose the day of the week when your holiday will begin and end and because we don't have weekly 'change-over days' you can rent for as long as you wish and come and go any day of the week � you choose! Additional days above a standard week(s) are priced pro-rata � simply divide the weekly price by seven and multiply by your total choice of days. 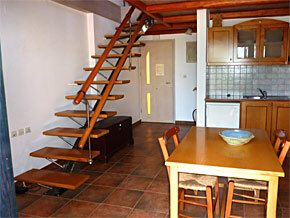 Please contact us for details of discounts for a stay of more than ten days. We are pleased to accept payment in a number of other international currencies. Please ask for rates and payment details. Click here to visit a currency converter site.